There has been a long history of fluvial flooding in the Haydon Wick area of Swindon, from the Haydon Wick Brook, the Haydonleigh Drive Drain and the Haydon Wick Drain. There has also been incidents of flooding from the surface water sewers which discharge into the various watercourses due to the high water levels during flood conditions. Richard Allitt Associates were appointed as sub-consultants to Royal Haskoning to model the surface water sewers and their interaction with the watercourses. 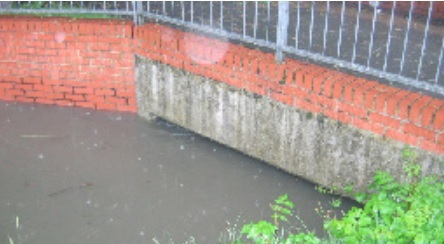 The modelling of the surface water sewers was undertaken using InfoWorks CS 2D with level hydrographs applied to the outfalls for the various scenarios to replicate the river levels. The level hydrographs were exported out of the ISIS river model by Royal Haskoning. Similarly RAA exported outflow hydrographs for each of the surface water sewer outfalls to allow Royal Haskoning to model the inflows from the surface water systems into the watercourse. RAA also produced GIS layers showing the depth and extent of flooding from the surface water sewers which were incorporated into the flood maps produced from the river modelling. During this project it was found that as well as raising the flood defence walls it was necessary to add flap valves to a number of the surface water outfalls to prevent reverse flow from the river during flood conditions causing flooding from the surface water sewers.